It’s Sunday morning, day one. The alarm clock shows 6.00 am and its beeping makes it very clear that it’s time to get up. It’s still dark outside, the coffee fragrance is in the air leading us to the breakfast lounge of the Umkomaas lodge; a few muffins satisfy the stomach and get us ready to go. The equipment is all set-up, the wetsuits are on and the boat is loaded. It’s not often to see people getting up before dawn with a smile on the face, but when your early wakening anticipates two dives packed of sharks, then the perspective totally changes. The launch with our speedboat is still the same: hold on tight, put your feet in the straps and the jumping and slalom between the waves kicks the day off. The first dive is a baited dive, but not before having attracted a few dozen blacktip sharks around the boat. We kit-up and with a rollback we are in what looks more like a shark soup then a place in the Indian ocean. The washing machine drum full of smelly fish hangs at an eight meter depth and we’re looking all around at the blacktips getting crazy as they smell the appetizing sardines. The second dive is at one of the very famous spots, Raggies Cave, always on Aliwal Shoal. As the name suggests there are a number of ragged-tooth sharks swimming around, carrying out their daily tasks, but also moray eels, turtles and other great animals, allowing us to take the perfect shot. Look in the sand, you may find a shark tooth to take home as a trophy! Is the only souvenir you are allowed to take from the sea. Even if the next day’s program seems very similar to yesterday’s, each dive is characterized by unique encounters. Switching the order of the dives, we start with the reef dive, in Cathedral this time. More ragged-tooth sharks (also called grey nurse-sharks by some), schools of snappers and – welcome! – a couple of turtles make the dive. We save the baited dive for the second jump, and here the magic happens, after a few minutes with at least 30 blacktip sharks: a familiar shape emerges from the dark, the rounded nose and the stripes on the sides leaves no doubt, it is a gorgeous four-meters tiger-shark that will give Vegard, our dive master and shark-guard, a hard time to keep the whole bait bucket away from the tiger-sharks’ greed while giving us a great time in admiring and taking pictures. What an experience! The fourth day more people of the group joins in and the program repeats: reef dive in Raggies Cave, where a giant manta ray comes to say “Hi”, and Bernard catches a fantastic pic with a raggie in the front and the manta in the background. Lucky diver! After this we give it another go for a baited dive with loads of blacktips. The fifth day we are ready to head off to dive Protea Banks, a great reef in front of Shelly Beach, one hour long the coast, south of Umkomaas. Here also the plan foresees both a reef and a baited dive. 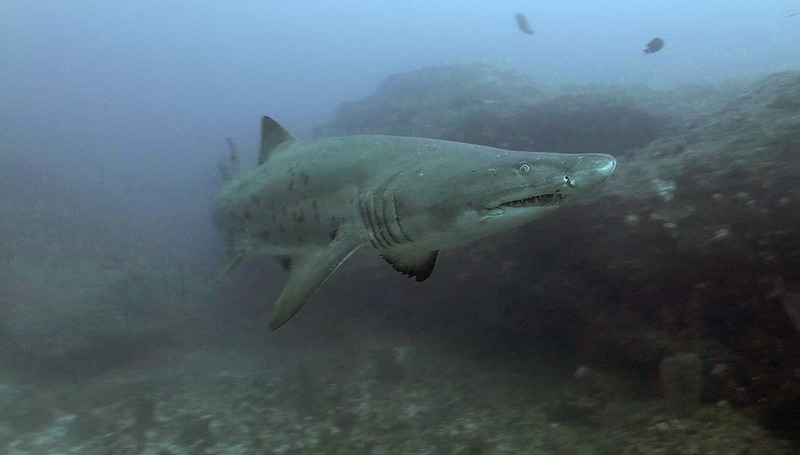 In the first drift dive along Protea we succeed counting up to 40 ragged-tooth sharks in the Northern Pinnacles, a tiger-shark and a shy bull-shark in the same dive. The second baited dive lets us share greetings with just a couple of blacktips. The sixth day, still in in Protea Banks, we only go for one baited dive where we manage to see the well hunted Zambezi bull-sharks and a few more blacktips hitting hard into the bait. It’s now time to drive south to Port St. Johns where we’ll spend five days chasing the Sardine Run and enjoying the “Seafari”. The first day of the Sardine Run is sunny and calm, we swim with a few whales and see many of them breaching on the surface. The spotting of a baby hammerhead on the surface is a real treat. The second day the wind picks up quite strongly, blowing from south-west, the needed good weather change to get more action. After a few hours out at sea we rather prefer going back and treat ourselves with a nice lunch up the mountain, in a singular restaurant called “Delicious Monster”. Warming up, together with mouthwatering food, we also have a great sea view. The colours of the sunset are breathtaking! The third and fourth day give us the same emotions, but emotions are never the same, as the various encounters we make are surely not the same! 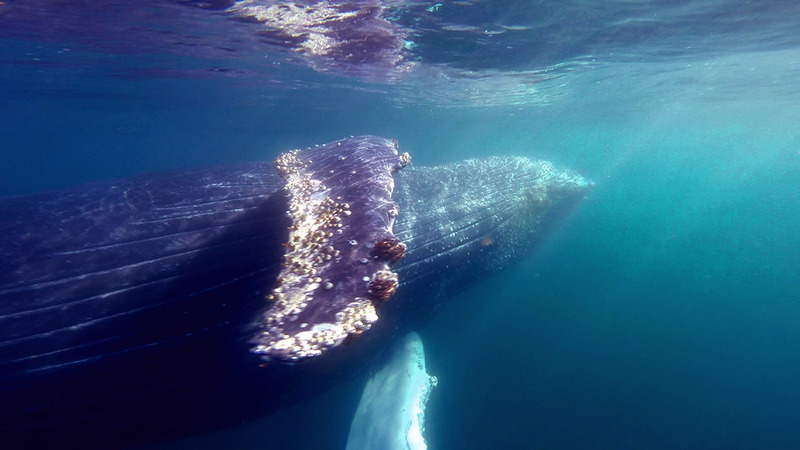 We are not so successful to get clean and defined sardine “bait balls” but are lucky enough to get loads of humpback whales breaching very very close to the boat. And what about dolphins? Everywhere! Common dolphins and we are also very happy when we spot a pod of bottlenose dolphins that happily play around the boat with a baitball of anchovies. We have the opportunity, thanks to Pulè our private driver, to also visit a little of the surroundings of Port St. Johns. The vegetation is amazing and the locals are so friendly. Big smiles and children waving as we pass by. Only Africa can provide you with these deep great feelings! Day five gives us the last chance to dive in a bait ball, but the sardines are shy this year so we are gratified by two dives on a reef, giving us a lot of life. Rays, sharks, moray eels and a lively colourful reef make our day. Here we go. On the road again! A six hour drive through the green countryside of the “Wild Coast” and of the Kuala Zulu Natal region, will lead us to Durban “King Shaka” International Airport, ready to fly to Cape Town, to meet Graeme and His Majesty, the lord of the seven oceans, the Great White Shark! The arrival is in the evening, and once settled in our rooms at the very nice hotel in Simon’s Town, we set off for dinner, all together at the “Cafè Pescado” where its friendly staff keeps everyone happy, fed and watered. Next morning the wake up is very early and we set sea before sunrise. On the boat we are all a little sleepy, but the fresh morning breeze and the excitement of what awaits us is kicking in! We get close to Seal Island as the sun rises, in twilight. This is the magic moment, the moment when the shark has an advantage on the seal, as he can see what is above him but the seal cannot see what is below. This is when we get our cameras ready and the tension on the boat becomes palpable, excitement rises as we are all looking around for a natural predation, for the breaching of a Great White or, how they call it, for the “Flying Jaws”. Minutes pass and… here we go! “THERE!” shouts Rob the skipper and points out in the sea, “Look, a solo seal, swimming away from the group” and this is what we were looking for; seconds later, HE comes soaring out of the water, literally flying into the sky. “Click-click-click” everybody snaps their pictures and only later we can see, on our LCDs, what is hidden in the detail of the photo. In the jaws of the shark we can see the doomed seal… Wow… the circle of life! A natural predation, that has been happening for thousands of years, without any interference, has just happened, before our eyes. Just few meters away. The tiredness of the trip, the hours on the boats, the morning chill, the coldish water, all is gone, in a second. Our hearts are warm and pounding full of excitement. We just saw a Great White Shark breaching from the ocean and flying in thin air. The size is very difficult to tell, but Rob and Graeme agree on saying is “nothing less than 4 meters and not more than 6”. Well, we can be happy. Before the sun fully rises, we have the chance of two other breaches and now it’s time to put the decoy in the water. It’s a dummy seal, a puppet in the shape of a seal, made of neoprene, towed by the boat and what we are trying to do is to stimulate another breach, in a specific spot, to help who was not lucky enough to get just the right shot. We then anchor the boat and lower the cage into the water, firmly tied to the boat. The cage can accommodate up to four people, but rarely there are more than two of us in it. We have been diving in South Africa for a few years now, but only recently we decided for the Great White experience because we do not approve how the operators are handling this activity in other locations. Since we met Graeme and his team, we are more than confident in doing this. In a totally secure and safe attitude but, more important, is the eco-friendly behaviour, the respect and approach they have to these magnificent creatures. We put our wetsuit on, mask and weights, ready to step over the boat and in the water. Once we get into the cage, we are handed a regulator with a long hose and down we go. The cage is deep enough to give us a 360° view around us. So we start looking around and waiting for the Great. I have to admit, the theme from “Jaws” is playing in my ears… Here he comes… “Zamalek” is his name and he comes out of the blue and heads towards the cage. Gets really close and then swims away… But comes back and swims around the cage, once, twice, three times… My heart is pounding, the GoPro is filming and the camera is shooting, I’m spinning around as a child on Christmas day. The magnificence of this creature is beyond description. His round black eye, the dark back and the white belly, the grin on his face (does it resemble a smile? A predator smile, perhaps? ), the teeth in his mouth that you can rarely see… I just can’t find the words to explain how incredible this encounter can be. We learn afterwards that the name “Zamalek” is the nickname for popular Black Label South African beer. It’s very strong and easily makes you drunk and dizzy so the name teases the Great in his going round and round the cage. Once we get out of the cage, other two divers get in but regrettably the shark swims away quite soon. But then we are lucky enough to have the visit of “Propguard”, another shark known to the boat crew because of distinctive propeller scars on the back. This shark is not so curious and does not stay for a long time with us, but we still manage to get awesome footage of him. Even by staying on the boat, we may get a really good look of the sharks in the water, merely few meters away from us. We are quite close to Seal Island as well and the colony of over 40.000 seals is a very rare and suggestive view that one has only seen on Discovery Channel from the sitting room sofa! Every now and then a penguin shows up between the seals and goes for a swim hunting for his lunch. I wouldn’t stop filling my eyes with all this, but we get back to Simon’s Town because it’s time for us to also have lunch! We are still chatting about the morning sharks and looking at each other’s pics while eating in a very picturesque restaurant, right on the dock of the bay. 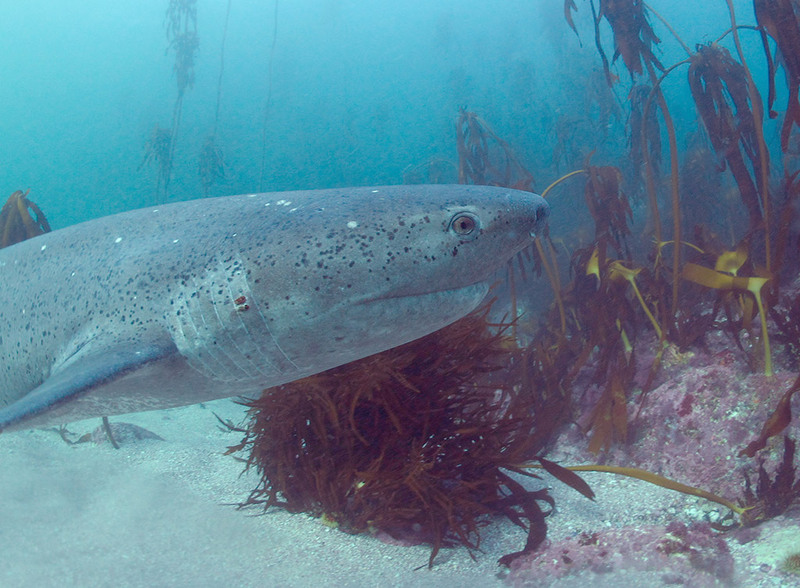 The afternoon is dedicated to the cow sharks, also known as the Seven Gill Sharks. These sharks can be found in very few locations of the world and Millers Point is one of them. 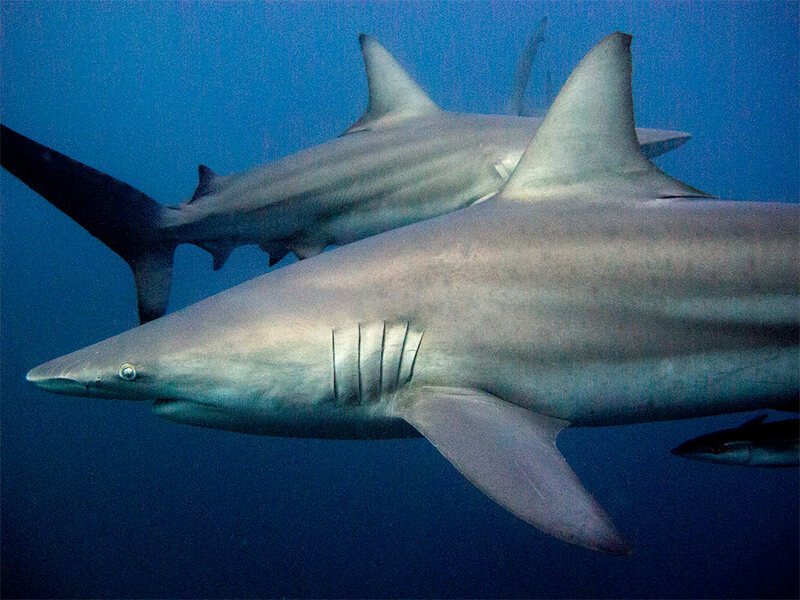 They are considered to be the connecting ring between the prehistoric sharks and the modern sharks. Very gentle and subtle in the daytime but extremely active and potentially dangerous at night. It’s considered to be another apex predator, as the bull shark. The environment that welcomes us is another very special one, the kelp forest. During this dive we also have the opportunity of spotting several shy sharks. We counted five different species of them. Once we return back on land, it’s time for a warm shower and a nice dinner, in another local restaurant, the Meeting Point, offering a tasting cuisine and a splendid view. Next morning we have one more “Flying Jaws” trip and time for a new cage dive. We just can’t have enough of Great Whites! In the afternoon we go to Partridge Point, where there is another little island where seals go to rest and warm up in the sun. 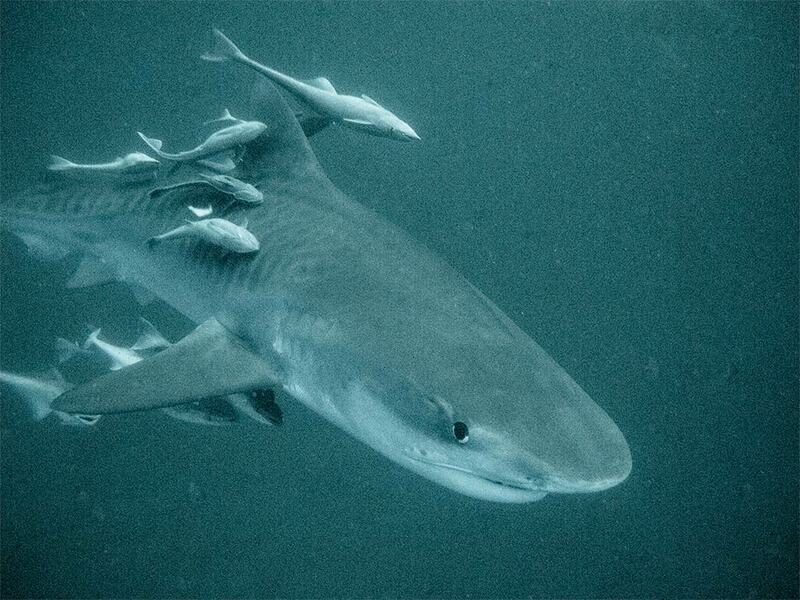 We have the opportunity to dive with them and enjoy their curious company, as they play around us and our cameras. Can we end our dives here? No! We enjoy it so much that we want more and more of it, so we jump back in with the cow sharks in Millers Point to drain our tanks. It’s dinner time, and this time we go to a well-known Sushi restaurant at the harbour. The next morning is the last morning together, so it’s time for farewells… There is just enough time to go to Boulders Beach, a bay where a colony of African penguins breed and nest. Another amazing location, where nature and wildlife have the lead. These funny little animals walk around undisturbed and free. They go for a swim, ride the waves like in the cartoon “Surf’s Up” or simply lay in the sun. This was a great treat to end our trip. The “Seafari & African Sharks” has been overall a great success. We met new friends, we saw amazing landscapes, breathtaking sunrises and sunsets, we encountered incredible creatures and, most of all, we saw 14 different shark species! This trip will be remembered in the years on.